The stress and the hustle and bustle of today’s life has often led to people wanting a quiet space of their own to relax and unwind after a hard day’s work. Gardens are an ideal place to relax amidst nature in the fresh air. Gardening and growing plants is also an ideal way to relax at the end of a tiring day. Since it is not always possible to go out on holidays to waterfalls, landscapers have attempted to bring the waterfall into the gardens. The addition of a water fountain tends to change a very ordinary garden into something extraordinary. This becomes the focal point around which the garden is landscaped. Landscapers generally make two fountains with the bigger one being the focal point. The type of water fountain depends upon the type and size of the garden. 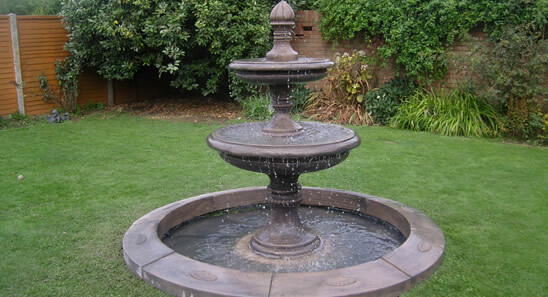 Tiered fountains are those that are commonly found in the Mediterranean with carvings of animals or Greek gods. The color and look of the fountain should blend in with the environment. The disappearing fountain is very popular due to the fact that there is no water body visible and is thus very safe for children. Maintenance is also easier for this type of fountain. Disappearing fountains, wall fountains, and Japanese fountains are ideal for small gardens. The advantage of having a water fountains is that it promotes good health and peace of mind by calming the nerves and relieving stress. The sound of running water can act as a sound barrier to harsher sounds from the outside. This is an ideal way to attract butterflies, birds, and bees into your garden. The dragonflies will help keep the mosquitoes at bay. It also helps to an extent to clean the atmosphere around you.